Event combined political activism, artistic performances and fireside chats. White House Initiative on Asian Americans and Pacific Islanders team. 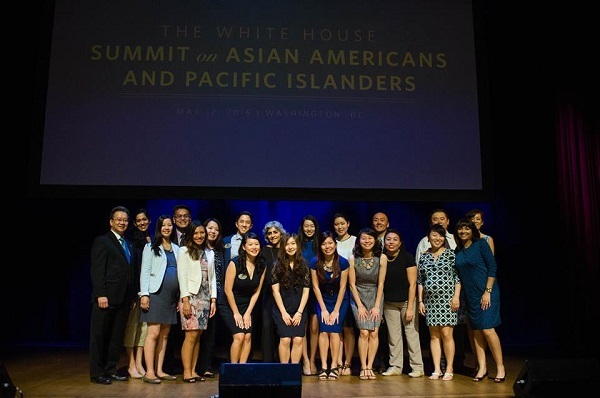 WASHINGTON, DC: The daylong White House Summit on the Asian Americans and Pacific Islanders, the first-ever White House-sponsored celebration of heritage and advancement in the AAPI community, held on May 12, combined political activism, artistic performances and fireside chats. More than 1,500 community and political leaders, business executives, advocates, and artists from 40 different states gathered at George Washington University’s Listener auditorium, sharing their stories. They emphasized on improving the lives of members of the AAPI community everywhere, engaging with congressional and administration officials, and AAPI leaders on key issues facing the AAPI community including economic growth, education, healthcare, civil rights, and immigration. The opening ceremonies began with a moment of silence for those affected by the earthquakes in Nepal and a Hawaiian chant by Kamana’opono Crabbe, chief executive officer of the Office of Hawaiian Affairs. The event mixed a lighter tone with a Hawaiian drumming performance and comedic welcoming remarks from the master of ceremonies, Parag Mehta, chief of Staff, Office of the Surgeon General, US Department of Health. Mehta lightened the atmosphere with his great sense of humor and was the perfect master of ceremony for the occasion. It was impressive to see so many high profile Indian American officials from the White House gathered under one roof. The long list included Kiran Ahuja, Executive Director of the White House Initiative on AAPI, who was the main organizing force behind the event. Ahuja highlighted President Barack Obama’s accomplishments in the AAPI community, among them the president’s appointment of 20 AAPI federal judges during his time in office. Vivek Murthy, the first Asian American US Surgeon General, shared some biographical details, telling that he owed his success to his immigrant parents who came from India. Other Indian Americans attending the summit were Indian American Rep. Ami Bera, Acting Assistant Attorney General for the Civil Rights Division at US Dept of Justice Vanita Gupta, Deputy Policy Director of Immigration at the White House Domestic Policy Council Manar Waheed, Vice President of Policy at Gill Foundation Gautam Raghavan, National Director of National Counsel of Asian Pacific Americans Mini Timmaraju, and Executive Director of Master Card Center for Inclusive Growth Shamina Singh. Popular TV and film actor Sakina Jaffrey added glamour and fun. Joie Chen, the anchor of Al Jazeera America’s “America Tonight,” moderated a panel discussion with prominent women in the AAPI community, including Ai-jen Poo, the director of the National Domestic Workers Alliance and Timmaraju. They discussed the overlap of issues of both women and AAPI with a focus on immigrants and workers’ rights. The panel also discussed ways to include the voices of AAPI in the immigration debate, which tends to focus on Hispanic populations. The session continued with a fireside chat moderated by Raghavan, the vice president of policy at the Gill Foundation and the former White House LGBT liaison. Gina McCarthy, the administrator of the U.S. Environmental Protection Agency, along with the other panelists, discussed the role of government agencies in the AAPI community. The discussion ended with a call to action for young people to become more involved in public policy for issues they’re passionate about. “If you want to be rich, it might not be the path for you, but if you want to have a rich life, there is no better way to go,” McCarthy said. The morning session concluded with an artistic performance by Hawaiian musicians Paula Fuga and Kaumakaiwa Kanaka’ole. Asian Americans are the fastest growing voter bloc in the United States and they make up approximately 6 percent of the population, but by 2050 they are expected to reach 10 percent. President Obama’s Advisory Commission on Asian American Pacific Islanders has worked since 2009 to address issues like immigration, healthcare and economic development that affect the community, which is the fastest growing racial group in the country. Former President Bill Clinton originally created the event, and President Barack Obama reestablished it with an executive order in 2009. Over the past five years, the Initiative has reached more than 100,000 AAPIs across the country, delving deep into every region to hear the most pressing issues in the AAPI community and taking action to expand access to federal services. President Obama was not present, but his 15 cabinet secretaries and senior administration officials participated in the Summit on AAPIs, explaining how the Obama administration’s actions have benefited the Asian American community. They included Secretary Sally Jewell, U.S. Department of the Interio; Secretary Tom Perez, U.S. Department of Labor; Secretary Sylvia Burwell, U.S. Department of Health and Human Services; Secretary Julián Castro, U.S. Department of Housing and Urban Development; Secretary Arne Duncan, U.S. Department of Education; and Secretary Jeh Johnson, U.S. Department of Homeland Security. The Summit is part of the main celebratory week of events during AAPI Heritage Month and provides a unique forum for networking with thousands of AAPI leaders as they come to Washington, D.C., from across the nation.